Abstract � Gallium Nitride and Silicon Carbide are two representative materials for the third generation wide bandgap semiconductor. Gallium Nitride power transistors have higher electron mobility than SiC, making them superior devices for high frequency and efficient switching. The lateral HEMT device structure is also a more suitable topology for power integration together with driver and control blocks to achieve a ultra-high power density module and system. 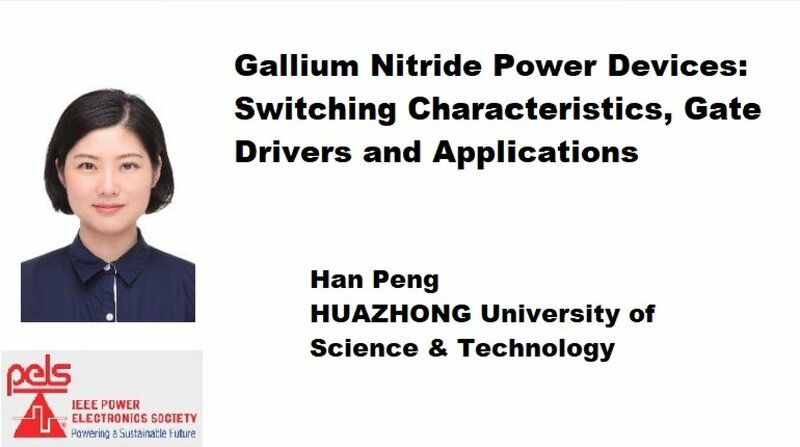 This presentation will discuss an accurate and comprehensive evaluation of GaN switching characteristics. The effects of gate driver topologies, gate resistors and deadtime will be explored. Several different applications of high frequency GaN based power conversion will be illustrated. Bio- Dr. Han Peng received her Ph.D. from Rensselaer Polytechnic Institute, Troy, NY, USA, in 2011. Between 2011 and 2017, she worked at General Electric Global Research Center at Niskayuna, USA. She was an adjunct professor at Rensselaer Polytechnic Institute in 2012. She was the Distinguished Principle Engineer at Powerland Technology Inc. in Nanjing China in 2017. Currently, she is a professor in department of Electrical & Electronics Engineering at HUAZHONG University of Science & Technology, Wuhan China. Her research interests include wide bandgap power devices module design and applications, high frequency, high power density power management IC design, energy harvesting. Her research covers various different applications, as communication power, healthcare electronics, more electrical aircraft systems and electric vehicles. She has published about 20 high quality papers. She has two patents filed and seven more pending. She is an Associate Editor of the IEEE Transactions on Power Electronics since 2017.